UEMC conducts a primate monitoring programme in two of the largest and most important forests of the area, Mwanihana (north, within the National Park) and Uzungwa Scarp (south, within the Nature Reserve). Some of the data goes back to 1998 when the programme started (by primatologist Tom Struhsaker and other researchers). The programme represents the longer term data-set for the area. Four line-transect censuses, 4 km in length, are conducted in both forests twice per month, by walking transects at a pace of about 1 km per hour by UEMC technical personnel. Data are collected according to a standardized protocol and entered into a computer and periodically analyzed. Until 2017, nearly 900 transect repetitions were conducted in Mwanihana, and nearly 400 in Uzungwa Scarp. See under Resources for further details. Since 2009, UEMC is part of the Tropical Ecology Assessment and Monitoring (TEAM) , a network of field stations in the tropics implementing standardized biological monitoring. The programme aims to provide an early warning system on the status of tropical biodiversity that can effectively guide conservation actions. TEAM’s core monitoring site is Mwanihana forest. Data are collected on terrestrial vertebrates (through camera trapping at 60 points), arboreal vegetation (6 vegetation plots) and climate (through an automatic weather station) according to standardized protocols. All data collected are uploaded in near-real time to the TEAM portal and are publicly available. 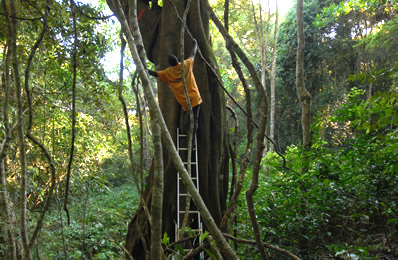 With several projects in the Udzungwa Mountains, this programme run by the Natural History Museum of Denmark aims at documenting and understanding how processes like speciation and dispersal interact in the long-term accumulation of species and the high endemism levels of the Eastern Arc Mountains. We are mapping local radiations as found in poor dispersers like millipedes, and we investigate how diversification patterns may differ, e.g., between young taxonomic groups like birds and old mega-diverse groups such as insects and spiders. We want to elucidate and explain the evolutionary mechanisms causing the current patterns. To achieve this, we generate new data on the distribution of the ‘smaller majority’ (insects, spiders, millipedes, etc.) within the Udzungwa Mountains through large-scale fieldwork involving year-round sampling (Malaise and pitfall traps) as well as quantitative sampling using protocols that are developed by ourselves, coupled to next-generation sequence-based biodiversity assessment. human disturbance monitoring: it is linked to law enforcement and aimed to assess the impact of various forms of anthropogenic pressure in the park. Until 2011, firewood collection by adjacent communities was allowed on weekly basis. graduate and under-graduate students from Tanzania and abroad on biodiversity research and monitoring. This latter component was boosted since 2010 with the opening of the hostel annexed to the main UEMC structure, as it triggered formal training schools. Up to 24 students can currently be accommodated in the dormitory. From 2011 to 2016 MUSE – Science Museum with the University of Trento (Italy) and other partners have held five editions of a summer school entitled "Tropical Rainforest Biodiversity: Field and GIS Tools for Assessing, Monitoring and Mapping" which involved international and Tanzanian students as well as park ecologists to practically learn key monitoring tools and GIS applications. Additional training courses are organized by the Natural History Museum of Denmark. UEMC conducts a school education programme since 2007, in line with its mandate of promoting environmental awareness by adjacent communities. The programme works with several primary and secondary schools in the villages near UEMC and all along the eastern edge of the National Park. Activities include class-based seminars and lessons on the Park’s biodiversity and its importance, guided visits by the students to the National Park, seminars given by researchers at UEMC, poster competitions, and special events such as celebration of World Environment Day. The programme collaborates with Associazione Mazingira, an Italian non-profit that since 2012 implements with MUSE community conservation activities in the area. This broader programme includes support to environmental sustainable livelihoods and practices, such as the adoption of energy-efficient cooking technologies, agro-forestry, boosting eco-tourism and various income-generating activities. Founded in 2010, Association Mazingira is a no-profit organization based in Trento, Italy, and working with MUSE in the field of environmental community-conservation. Its objective is to promote sustainable management of the Udzungwa Mountains, with special attention to engaging local communities. The implementation of agroforestry projects, tree nurseries, environmental education in both schools and villages and the promotion of energetically efficient technologies are the main activities that Mazingira carries out in 12 villages of the Kilombero Valley. Launched in 2017, this project aims to protect the exceptional biodiversity and ecosystem services of the Uzungwa Scarp Nature Reserve by supporting the Tanzania Forest Service and local communities to reduce illegal activities in the reserve. The Uzungwa Scarp Nature Reserve, south of the National Park, is the second largest forest patch in the Udzungwa Mountains but has not been adequately protected in the past and has already lost much of its wildlife. Despite this the forest is still home to many globally threatened species, especially for primates and amphibians. USPP will train local rangers to patrol more effectively using GPS and GIS technology in order to reduce poaching and logging. This project is a partnership between Associazione Mazingira, MUSE, Southern Tanzania Elephant Program and the Whitley Wildlife Conservation Trust with associated biodiversity monitoring by UEMC. Since 2010, Pennsylvania State University has conducted an integrated research-education abroad programme focused on villages near Udzungwa Mountains National Park and based at the Udzungwa Ecological Monitoring Centre. Co-directed by professors Larry Gorenflo (Department of Landscape Architecture) and Carter Hunt (Department of Recreation, Park, and Tourism Management), the Tanzania Parks and People Programme focuses on community design and ecotourism in selected communities close to the park. The project aims to help local people meet resource demands without adversely affecting Udzungwa Mountains National Park or other reserves in the area. Formerly the Udzungwa Elephant Project (founded 2008), STEP works to help protect critical elephant populations in southern Tanzania, through protection efforts, community projects, monitoring and research, and advocacy. In the Udzungwa Mountains and the adjacent Kilombero Valley, STEP has beehive fence projects with three Farmers Groups to enhance human-elephant coexistence amongst local communities; monitors elephant movements in the mountains as well as crop damage in the farms; and undertakes field assessments and advocacy for vital wildlife corridors. Run by Drs Grainne McCabe, Bristol Zoological Society and David Fernandez, University of the West of England, the project aims to monitor the population of the Sanje mangabey in the Mwanihana forest, within the National Park and in Uzungwa Scarp Nature Reserve and undertake long-term study of the behavioural ecology of the habituated ‘Mizimu group’ in the park.